Smokers have been used for years to infuse food with a smoky flavor that you just can’t get with any other cooking method. Not only do they make food taste great but they also become a talking point amongst friends and family. If someone is using a smoker then you can bet they will have friends knocking at their door! If you enjoy cooking outdoors, a smoker will make a great investment - it should provide years of beautiful roasts, ribs, pulled pork or beef, vegetables and more. Even the tougher cuts of meat will taste delicious when slow-cooked in a smoker - in fact some of the more inexpensive, fattier cuts actually work better with this cooking method, as the fat keeps the meat tender while it's cooking. The tougher parts of the meat are broken down during the process, leaving you with delicious food that practically falls apart. Cooking area: 730 sq. in. The Masterbuilt 30-Inch Electric Digital Smoker is the real bad boy of smokers and is one of the top sellers in this category. If you want the best of the best then this smoker is for you. It has a digital control, which means you can set it to the exact temperature you want, so your food will be cooked perfectly every single time. The walls are heavily insulated and virtually no heat is lost when in use, which means the food is cooked evenly and you don’t have to worry about constantly turning it over. There is also 730 square inches of cooking space, plenty for even the biggest of families or group of friends. The Bri﻿﻿﻿﻿﻿﻿nkmann Electric Gourmet Grill and Smoker is the traditional-style Brinkmann smoker, and it couldn't be simpler to use. No charcoal, no mess, nothing to set up, just put in your wood chips, water & meat, turn it on, and prepare to enjoy the most delicious meat you have ever tasted. Some users mention the small amount of lava rocks Brinkmann supply with the smoker - for best results you will need to buy an extra bag of lava rocks. The smoke escaping from the lid is also mentioned, however the smoker is designed to do this - the lid is deliberately made slightly small, so the smoke has somewhere to escape. Check out our guide for how to use this type of smoker. Cooking area: 140 sq. in. 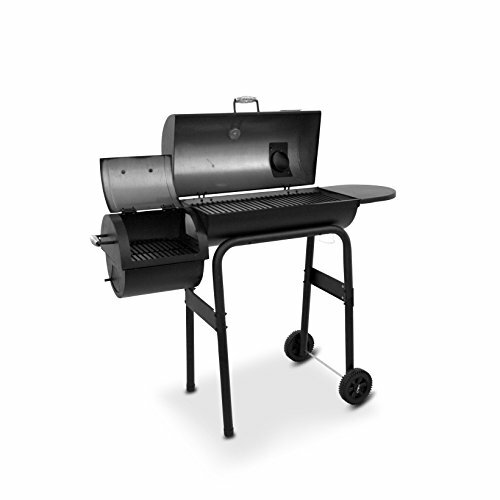 The Char-Broil American Gourmet Grill is another offset smoker that is great for beginners to smoking their food. It’s the most affordable smoker on our list. It is also ideal if you don’t cook for many people as it is faster to get going and you don’t need to use as much wood. You get a single cooking grate which is big enough for most types of meat. The ash can be removed easily through the side shelf to prevent flare ups. If you are just getting started, then this is a great beginner smoker. Some users have mentioned the small size, this has both positives and negatives. 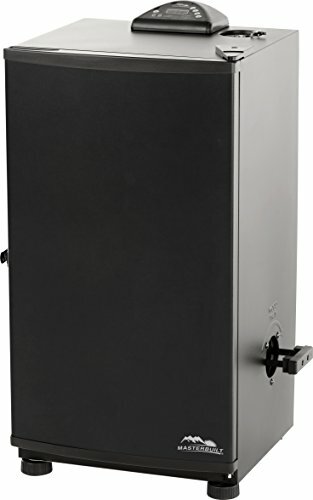 You will not be able to cook for a large crowd using this smoker, however the small size means the smoker heats up faster, uses less fuel, and is easier to move and store out of the way when not in use. Be careful when monitoring the temperature, as excessive temperatures for long periods can cause the paint to peel (purely a cosmetic issue). As with all things, you get what you pay for, and this smoker is aimed at the entry-level market, and priced to suit. Cooking area: 1176 sq. in. 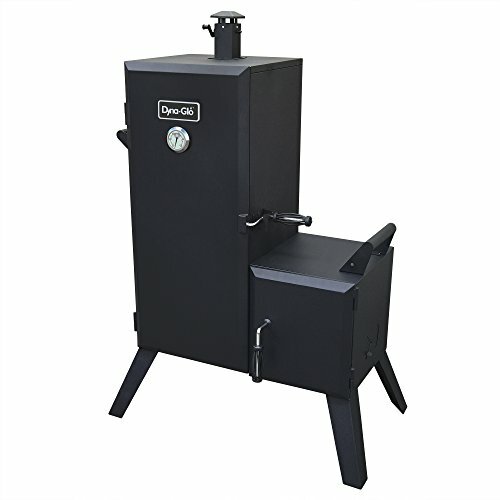 The Dyna-Glo Charcoal Smoker is an offset smoker, which means the heat source is not directly below the food, instead being housed off to the side. This means the food gets the benefit of the smoke, while the food on the lower racks is not damaged by excess heat. This smoker has a huge amount of cooking space for any type of meat you can imagine - 1176 square inches to be exact. It has six separate adjustable shelves, each with a 25lb capacity. The manufacturer claims you can smoke up to 150lb of food at once, which should be more than enough for the largest backyard parties. There is also a handy thermometer so you can get the temperature exactly what you need it to be. The frame and body are heavy-duty steel, powder-coated for protection against the elements - however to extend the life of this (or any) outdoor cooker, it's a good idea to invest in a cover. Some users report slight smoke leakage, and recommend sealing the smoke box and firebox doors with high temperature silicone (available for a few dollars) - this is a minor issue though. 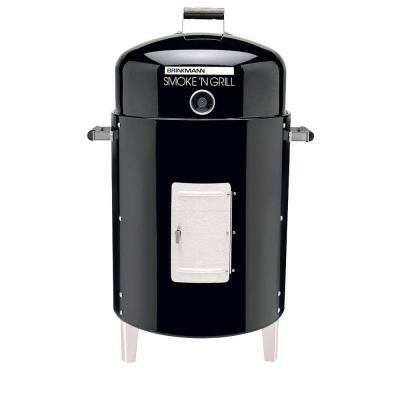 Overall this is a great smoker, and may be the perfect choice if you're planning to use it for large parties and events. There were no recalls listed for any of the smokers mentioned here at the time of writing (January 2019). However, it's always a good idea to check the latest information at the Consumer Product Safety Commission website before buying any large, expensive or potentially dangerous product. Do you own any of the smokers mentioned here? Did you choose a different one? Let us know in the comments!